In the class, we briefly introduced the Trade Adjustment Assistance (TAA) program, which has played a critical role in the past decades both financially helping trade-displaced workers and tactically facilitating trade liberalization agendas in U.S. trade policy. It is widely acknowledged that trade liberalization can benefit consumers and create new market-access opportunities for export-oriented firms. However, expanded trade may also exert negative and often concentrated effects on domestic industries and workers that face increased import competition. Freer trade is not entirely free, but bears the cost of economic adjustment. TAA program therefore is designed to provide readjustment assistance to firms and workers that suffer dislocation (job loss) due to foreign competition or offshoring. 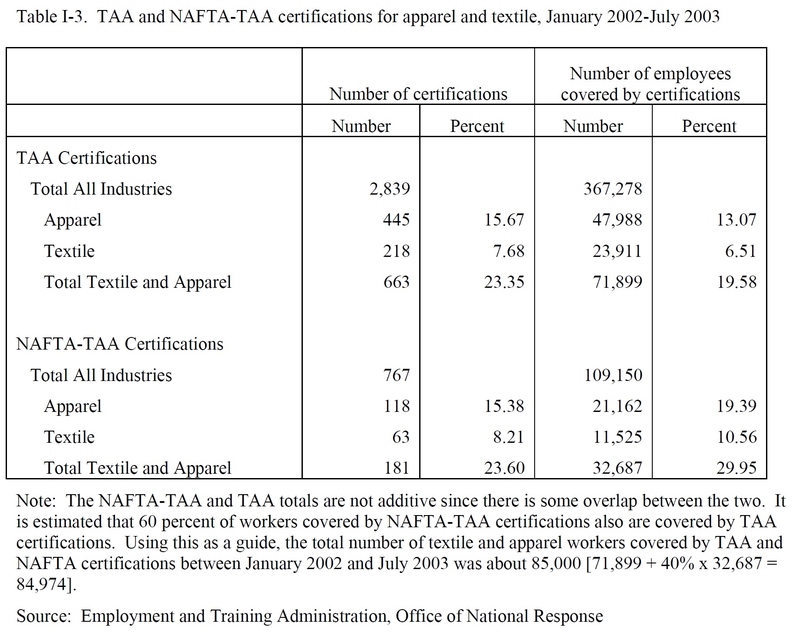 To be noted, TAA has been a significant tool to assist workers in the U.S. textile and apparel industry. According to official statistics, since 1974, 2.2 million American workers have benefited from the TAA program, which provides workers with opportunities to obtain the skills, credentials, resources, and support they need to obtain good jobs in an in-demand occupation — and keep them. TAA was last authorized in June 2015 to continue through June 30, 2021. An increase in competitive imports: The sales or production of the petitioning firm have decreased absolutely and imports of articles or services like or directly competitive with those produced by the petitioning firm have increased. A shift in production to a foreign country: The workers’ firm has moved production of the articles or services that the petitioning workers produced to a foreign country or the firm has acquired, from a foreign provider, articles or services that are directly competitive with those produced by the workers. Adversely affected secondary workers: The petitioning firm is a supplier or a downstream producer to a TAA-certified firm and either (1) the sales or production for the TAA-certified firm accounted for at least 20% of the sales or production of the petitioning firm or (2) a loss of business with a TAA-certified firm contributed importantly to the workers’ job losses. Additionally, workers who lost jobs from firms that have been publicly identified by the United States International Trade Commission (USITC) as injured by a market disruption (for example, in anti-dumping, countervailing duty or safeguard cases) or other qualified action can also submit TAA petition. Training and reemployment services and income support for workers who have exhausted their unemployment compensation benefits and are enrolled in training. Workers age 50 and over may participate in the Reemployment Trade Adjustment Assistance (RTAA) wage insurance program. Certified workers may also be eligible for a tax credit for a portion of the premium costs for qualified health insurance. TAA is financially covered by the federal government (i.e. taxpayers’ money) through annual appropriations. Appropriations for the program in FY2016 were $861 million, of which $450 million was for training and reemployment services and the remaining $411 million was for income support and other activities. Back in 1992, newly elected President Clinton oversaw the implementation of the North America Free Trade Agreement (NAFTA), but did so only after a number of conditions were attached, including TAA. 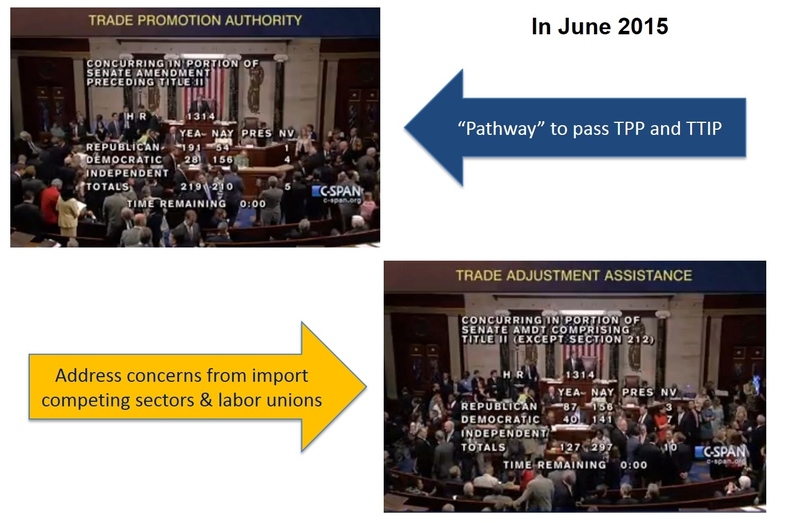 In 2002, President Bush and the Republicans pushed hard to renew the long-expired trade promotion authority (TPA), but Democrats were unwilling to provide it unless TAA was reauthorized. 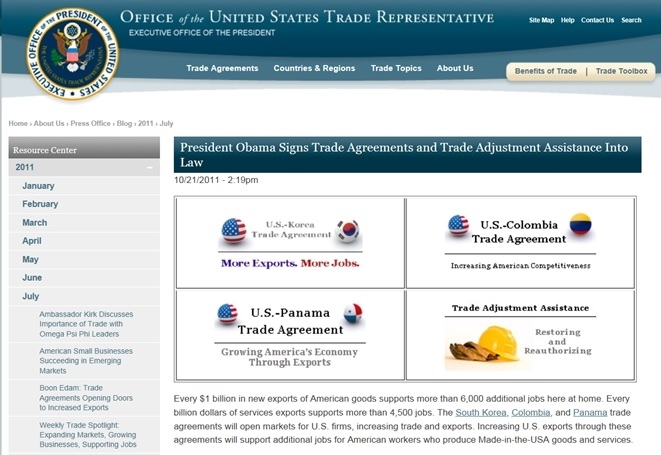 TAA was also directly linked to the passage of three free trade agreements (FTAs) by US Congress in 2011, including US-Korea, US-Columbia and US-Panama FTAs. Economic efficiency: some critics argue that economic efficiency was far from guaranteed given that subsidies can operate to reduce worker and firm incentives to relocate, take lower-paying jobs and in other ways to carryout necessary reform. Equity: some critics argue that because many economic groups hurt by changing economic circumstances caused by other than trade policies were not afforded similar economic assistance (for example, domestic competition and technology advancement). For the sake of fairness, if society has a responsibility to help all those dislocated by economic change, then policies should not be narrowly restricted to trade-related harm only. Administrative cost: it is argued by some economists that defining and measuring injury from tariff reduction would be inexact, if not arbitrary. Some studies also suggest that many firms, even smaller ones, could adjust on their own, and that workers could just as well rely on more broadly available unemployment and retraining programs. In addition, the high costs of TAA would dilute political support for the program. The TAA helps workers who have lost their jobs as a result of international trade get back to work. Should the purpose of the TAA be to provide compensation to workers who have lost their jobs due to trade or should it be to help workers find new jobs? Yes, worker compensations can help employees worry less about having to pay their bills, but wouldn’t helping them find a new job be more beneficial in the long run? I believe that the TAA is a valuable program for helping workers who have lost their jobs, but I know that unemployment is still a major concern in America. Therefore instead of ensuring workers compensation they should ensure them a job. The TAA should work to provide these workers with a training program to give them the skills they need to work advanced jobs and then once they complete the training program, such workers would be given a job. With the U.S. apparel industry being capital intensive, relying heavily on machinery and computers, giving these workers such advanced skills to help them operate machinery would be the most beneficial in order to allow them to survive in the U.S’s textile industry. I think programs like TAA are important and necessary for a government to help its citizens keep up with the pace of globalization and help them navigate the job market, hopefully working to minimize unemployment. But I agree with the concern that this program is not equitable. This argument makes the TAA feel like something with the main purpose of lessening pushback against international trade deals. We have discussed how job loss in the textile industry is often due more to technological improvements than international trade. It is just as important for workers to receive similar assistance – in getting new jobs and with making ends meet during a transition period – in cases like this. Citizens should be made able to adjust to changing industries.